Get your fill of Parks and Recreation...at Michigan State Parks! We're a long way from fall, but now is the time to make plans to attend state park harvest festivals! Many of these seasonal celebrations require camping reservations, and it's the perfect way to end the summer and get up-close and personal with Michigan's spectacular fall colors. Click here to view the calendar of state park harvest festivals. Please note that new events are being continually added to this calendar. Check back often for updates. Check camping availability and make a reservation at www.midnrreservations.com or by calling 1-800-44-PARKS (1-800-447-2757). Porcupine Mountains Wilderness State Park was nominated as one of the best state parks in USA Today's 10Best Readers' Choice Awards, and we need your help! 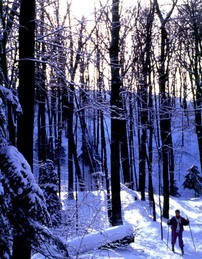 Vote daily at http://www.10best.com/awards/travel/best-state-park/porcupine-mountains-wilderness-state-park-mich/. The voting fun doesn't stop there. Travel blog 'Lost in Michigan' is hosting a "Michigan State Park March Madness" poll for readers to vote on their favorite state park. Head on over to lostinmichigan.net/2015-state-park-march-madness/ to cast your vote and help your favorite park advance to the finals! 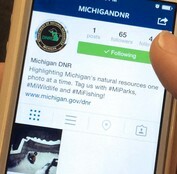 See a full list of Michigan DNR social media accounts at www.michigan.gov/dnrsocial. Last week the popular TV series 'Parks and Recreation' ended after seven seasons on NBC, but plenty of real-life parks and recreation awaits at Michigan State Parks! Check out the calendar of events at www.michigan.gov/gogetoutdoors. The White House on Belle Isle Park is currently used as the administration building, serving as a point of contact for visitors wishing to buy a Recreation Passport, reserve shelters and hold events on the island, but it has quite a storied past. The back of the house was built in 1864, and the front half of the house was built in 1873 by a German stonecutter who rented the house and named it "Inselruhe," which in German means "Island Rest." Since then, the house has also served as an ice cream and refreshments storefront and as a residence for the park manager.